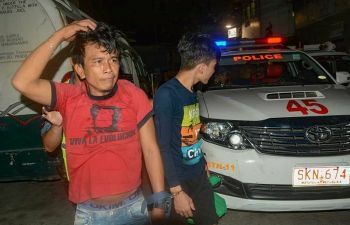 CEBU CITY (3rd Update) -- At least eight people have been reported dead after a motorized passenger banca bound for Camotes Island in Cebu sank off Ormoc, Leyte on Thursday, officials confirmed. Lieutenant Christopher Gamet, operations officer of Coast Guard District (CGD) Eastern Visayas, said that M/B Kim Nirvana, owned by Joge Bung Zarco, was carrying 173 passengers when it capsized around 12:10 p.m. just minutes after it left Ormoc port for Pilar, Camotes. The banca has a capacity of 178 people. Abel Garciano, public information officer of Poro, Camotes Mayor Luciano Rama, said eight bodies were recovered as of 2 p.m. Thursday, July 2, but reports circulating on social media mentioned more than 20 fatalities. All 15 crew of the passenger boat were rescued. “Malakas daw po yung alon at tsaka hangin (Big waves and strong winds caused it to capsize),” Gamet told Sun.Star Cebu. Some of the survivors were brought to a hospital in Ormoc, while rescue operations are ongoing as of this posting, as many passengers are believed to have been trapped. The banca measures 17 meters and has a gross tonnage of 33.58.